Region: Center of the Sonoma Wine Country, 3 1/2 miles S of Santa Rosa, 47 miles from San Francisco. 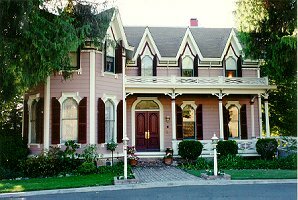 The Gables Wine Country Inn is a graceful Victorian bed and breakfast inn located in the center of the Sonoma Wine Country. Wine country travelers find The Gables to be the perfect location for touring the Sonoma, Glen Ellen and Kenwood appellations to the south, as well as the award winning Dry Creek, Alexander and Russian River Valley appellations to the north. Just minutes to the West is the spectacular North Coastline, and minutes to the Northwest is Armstrong Redwoods, a giant California redwoods forest. Sitting on three and one half acres. Friendly and caring innkeepers welcome guests to elegantly appointed guestrooms featuring goose down comforters, fine linens and toiletries. 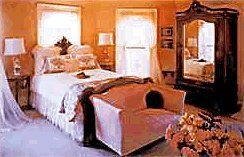 All rooms have private baths, with the separate creekside cottage having a whirlpool tub for two. A lavish multi-course breakfast is served each morning, and freshly baked pastries and tea are offered each afternoon. Rates $125-$195. This and other Santa Rosa Bed and Breakfast Inns can be found here in The Register. Romantic Country Inns, Getaways and B&Bs offer a great Sonoma Valley lodging alternative to big hotels.